If you are a history buff and love the watches at the same time, we have found a perfect place for you. 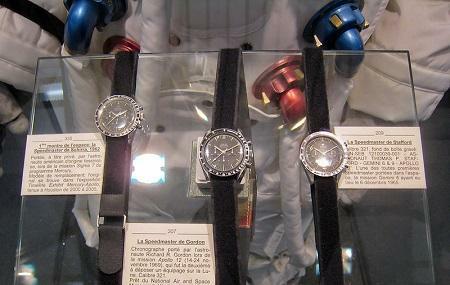 Omega Museum in Biel/bienne is a high-end museum that offers a great collection of watches by the brand. The entry to this museum is free and you can spend about 2-3 hours learning about its history. The museum provides audio tours as well and you can choose to listen any section of the museum. So, if you are a watch lover, head here with your family or friends, and catch an interesting video that plays the history on Omega and the making of it. How popular is Omega Museum? People normally club together Omega Sa and Biel Zoo while planning their visit to Omega Museum. I always had doubts about this brand. A year ago I bought an omega watch and it never worked properly...not even the after sales service understood the problem! The "museum" wiped away any doubt about this brand. This exposition (museums are different) is totally useless, it is just a jumble of watches and objects placed one next to the other with no strategy behind. Cherry on the cake, it is located next to a canteen! The smell of onion does not help at all. A free entry to this small OMEGA museum but a valuable time to be spent here learning about the history of this classic prestigious brand. You are provided with a headset and you can listen to the audio tour by choosing which audio file to play in each section of the Museum which is in a numerical order. If you are a watches lover and omega fan you'll love it being here, there is also a tv room where a video is being played about OMEGA's history and the craftsmanship behind it. The place to see and learn all about OMEGA's DNA. Wonderful museum, very interesting and well paced. The centre of the innovative watch universe!